The Path of the Bregoli starts from the church of San Martino, entrance of Parco della Chiusa or Parco Talon, and connects Casalecchio di Reno and the sanctuary of Beata Vergine di San Luca in Bologna. The Path of the Bregoli has been a pilgrims' way ever since the Middle Ages, but it took its present form during the years immediately after the Unity of Italy owing to a series of structural changes by General Manfredo Fanti in order to defend the territorial integrity of the Kingdom of Italy from the threat of Austrian assault: so, this path was large enough to allow guns as well as munitions to transit. An air-raid shelter was built inside a hill along the path to serve as protection of the civil population against enemy attacks from the air between 1940 and 1945. After this path stopped having a military role, the then parish priest Filippo Ercolani of the Curch of San Martino had the Stations of the Cross built along it in 1926. The Path of the Bregoli is a nearly two-kilometre path (C.A.I. 112/A path classification) that leads off the Church of San Martino and climbs Monte Castello through a wood populated by a large number of animal as well as vegetable species: poplars, alders and willows give shelter to woodpeckers, badgers, porcupines, squirrels, foxes and wild boars. 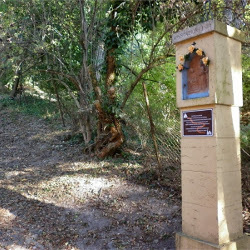 This path alternates slight slopes with steep ones such as the “Balzo della Pizzacherra” (Sbèlz d'la Pizacra in Bolognese dialect), where hunters from Casalecchio di Reno used to lie in wait for woodcocks up to the 1930s. This path also allows people to admire wonderful views of the plain where Casalecchio rises as well as the woody hills above it. On a sunny day in winter, even the peaks covered with snow in the Prealps can be seen, from Monte Baldo to Colli Berici. A large number of excursionists as well as pilgrims still follow the Path of the Bregoli for a walking tour, sport (mountain bike, jogging, nordic walking and fit walking) or a pilgrimage. Once the road acted as the most rapid connection between the Via Flaminia, Via Claudia and Via Petrosa to avoid going through the centre of Bologna between Modena and Firenze Fiesole. Visit www.sentierodeibregoli.it website to get more information.